Chopped Salad – the easiest dish ever! Since discovering chopped salads a few months ago, lunch time just go a whole lot easier. I was kinda late to jump onto the Thermomix bandwagon. I watched many friends around me purchase these shiny new machines. Personally, I thought I couldn’t justify it, that I already had enough kitchen gadgets to everything that I needed. Plus the hefty price tag was also a major deterrent. I avoided the Thermomix cooking demonstrations for years, until finally I went along to one at a friends house. Entering this party I had the mind set of never buying one of these machines. Two weeks later I was unpacking my own shiny new machine. It took a few weeks to discover the concept of the chopped salad in the Thermomix. It wasn’t just the mind blowing ease of this salad, but the taste and texture is amazing. You can mix up this salad with what ever ingredients that you like. 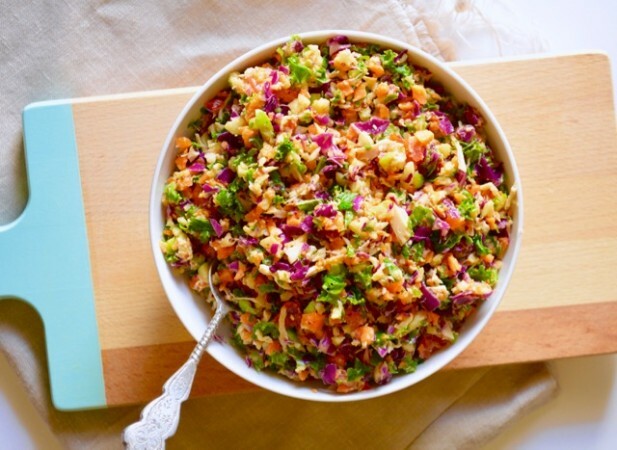 The chopped salad works well on its own or as a side dish to your main meal. Its nice to alway add an ingredient that will serve as a dressing for the salad. Otherwise your salad might end up a bit dry. In this chopped salad recipe the avocado and mustard create a light creamy dressing that is not over powering. You could also just use a dash of olive oil, fresh herbs and salt and pepper. For those who are not using a Thermomix, you can create the chopped salad in your food processor. Just use the pulse function until it gets to the desired texture. Roughly chop the vegetables so that they fit into the Thermomix or food processor. Place all the ingredients into your Thermomix or food processor. For those using a food processor, pulse until ingredients are finely chopped. If you liked this recipe, then why not download our FREE Wholefood Recipe book that has a full weeks worth of amazing recipes like this one. As a bonus, you will also get a FREE 3-day Mini Cleanse recipe book to supercharge your health.